Take 2 parts Free (Paul Rodgers and Simon Kirke), 1 part Mott the Hoople (Mick Ralphs), and 1 part King Crimson (Boz Burrell), and you have the ’70s rock supergroup Bad Company. On the basis of the band members’ resumes alone, Bad Company was destined to be something special and successful. Over the course of the first six albums, the group churned out straightforward, blues-influenced rock without the excesses of its peers and free of pretentiousness and frills. That approach of stripping rock to its bare essentials with recognizable hooks, yearning lyrics, and a compelling soulful vocalist in Rodgers defined the Bad Company sound and influenced many future rock bands from Foreigner to the Black Crowes. 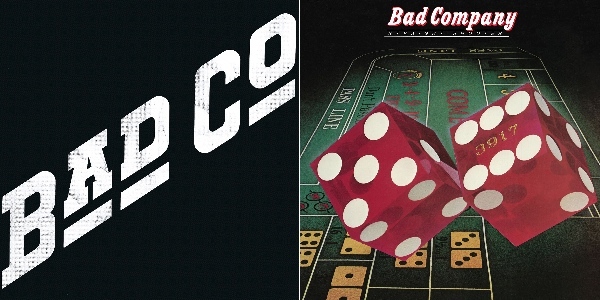 Now Bad Company’s first and finest two albums, Bad Company and Straight Shooter, have been given the super deluxe treatment, featuring both the original recordings and a slew of mostly unreleased tracks. The band’s 1974 self-titled debut album should really be called Bad Company’s Greatest Hits: almost all of the songs from that record had been featured on AOR radio: the bouncy “Can’t Get Enough” and “Movin’ On,” the haunting and gritty title song; the swinging “Rock Steady”; and the somber, melancholic “Ready for Love.” Given those memorable tracks, it’s easy to forget the rest of the album’s songs that are worthy in their own right, from the very soulful “The Way I Choose” to the graceful rootsy “Seagull.” Bad Company remains an essential cornerstone of ’70s rock, and its five-million sales prove it – This reissue contains several alternate versions of the album’s songs and outtakes, along with the B-side “Little Miss Fortune”; and a longer version of “Superstar Woman,” which ended up being re-recorded by Rodgers for his 1983 solo record Cut Loose. Straight Shooter (1975) was the rare follow-up album that wasn’t afflicted by the sophomore jinx. Its seamless mix of rockers (the taut rocker “Good Lovin’ Gone Band,” “Deal with the Preacher,” and the underrated “Wild Fire Woman”) and love songs (the elegant Simon Kirke-penned “Anna”) was pretty much a continuation of the first record. With its recognizable power chords, the ballad “Feel Like Makin’ Love” is definitely one of the band’s signature songs –you can’t go a day without hearing that song on classic rock radio. Another classic Bad Company track, “Shooting Star,” is a cautionary tale about the toll of the rock and roll lifestyle amid the then-recent deaths of Jimi Hendrix, Jim Morrison and Janis Joplin. This new version of Straight Shooter contains a generous amount of previously rare and unreleased tracks, including “Whiskey Bottle,” the B-side of “Good Lovin’ Gone Bad”; and an alternate recording of “Feel Like Makin’ Love” with a harmonica part. Over 40 years later, the music with those irresistible hooks from those albums still find a way of grabbing the listener in, assuring Bad Company’s ongoing popularity and timeless relevance.